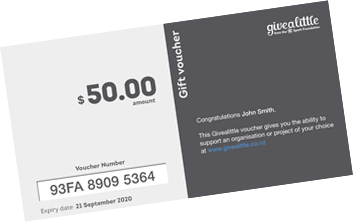 A Givealittle voucher can be used to make donations on Givealittle pages. It's the perfect gift for any occasion. Want to buy one? It's easy, just fill in the form below and confirm your purchase to proceed with payment. If you're looking for a unique gift for customers, staff, or any large group we can work with you to deliver branded Givealittle vouchers using your method of choice. Get in touch to organise bulk voucher purchases. Shown in the email sent. You can use Visa or Mastercard. Your voucher will look like this when generated. Confirm purchase below.